In K-12 education, word of mouth recommendations are an incredibly effective way of spreading the word about products. Getting teachers to formally and informally endorse digital tools and talk them up is invaluable. Some companies have found creative ways to tap into that. Nearpod has its group of PioNear teachers who spread the word. PBS has digital innovators, KQED had digital ambassadors, and Newsela has certified educators. Four years into our Listenwise journey, our director of community gave me a nudge and said it’s time we create our own teacher advocate program. But to me, it felt like a vulnerable move. What if we started a teacher advocacy program and no one wanted to join? It may sound silly, but what if you started a club and no one wanted to be in it? We have thousands of teachers on the platform, and the company has grown organically so I generally know by name (or met) most of the committed educators using Listenwise. But beyond them, who would join? If you’re an educator you have your reasons for dedicating extra time to become an advocate for a brand you love. We want to inspire participation, but also recognize that teachers are busy and don’t have many extra hours to devote to other projects. It’s led to many company discussions about what’s too much to ask, what’s too much to give. 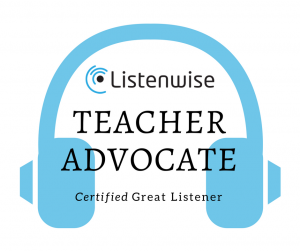 So what does a Listenwise Teacher Advocate need to know about Listenwise? They should be aware of the research on listening comprehension and reading comprehension that underpins what we do; how to expertly navigate the site and understand all of the features; and be up on the best practices for using Listenwise in the classroom. The first few teachers who signed up were ones we had known for a while as our power users. And then a few teachers I wasn’t aware of applied. I had never interacted with them and our team didn’t know them. They were true lovers of Listenwise who had only interacted with us through the website. It felt like a new phase of the business. We created a three-step application process that included an application, a written lesson plan using a Listenwise story, and a training course that requires teachers to watch online videos and take quizzes on the features to make sure they are expert users. We lean on our teacher advocates to get early feedback on new features and ask them what’s missing and what they would like to see added. 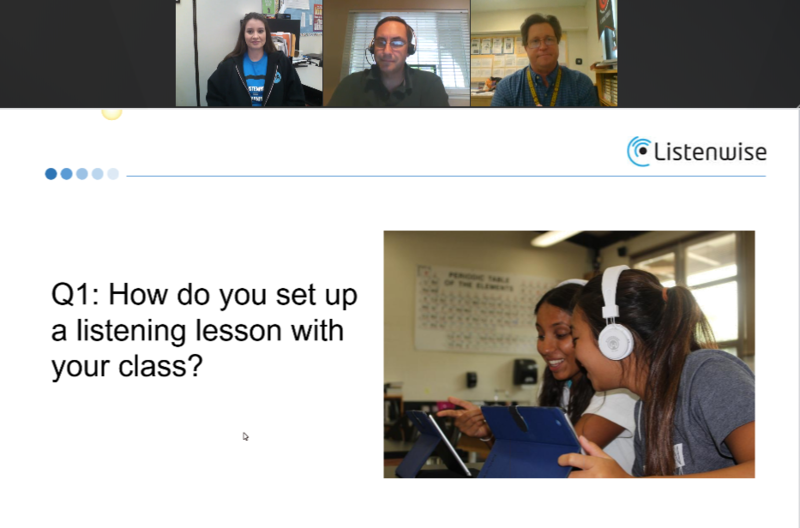 They provide really great insight into our product, and have new ideas for how to implement Listenwise in classrooms. We ask them to present in webinars, write blogs, and talk about Listenwise to spread the word. We even sometimes collaborate in person at conferences, or on school trips–like on this recent podcasting project we did with Erik Eve’s class. We are working to provide a learning community for our advocates where we provide them with additional resources, and where they have the opportunity to share ideas with each other and enhance their use of Listenwise. We started our advocate program with nine educators who helped us shape the program and process. When we opened the program to applications for a second round of advocates, we had seven additional motivated educators apply. Now, I feel a lot less anxious that we’d start a club and no one would want to join.